Disabled Ticket - Entitles the bearer to bring 1 (one) carer free of charge. Please note that ‘Carer Tickets’ are not issued online. To obtain your Carer Ticket, you will be required to present a valid Disabled Ticket and proof of entitlement to Disability Living Allowance (DLA), to the Box Office at the Main Entrance on the day. Our customer service staff will issue Carer tickets accordingly. Castle Howard Silver & Gold Friends and Annual Pass holders are entitled to a discounted ticket rate. Please note this discounted rate will not be available after 4pm on Friday 2 August 2019. Set in the magnificent gardens of Castle Howard, our spectacular classical concert will be a night to remember for the whole family. Guest soloists will be joined on stage by the London Gala Orchestra conducted by Stephen Bell. 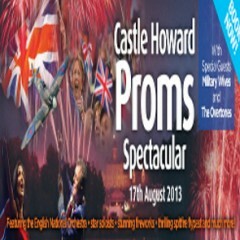 The programme will include popular classics, songs from musicals and all your flag waving favourites from the Proms including Jerusalem, Rule Britannia and Pomp & Circumstance No.1. With a Spitfire flyover, stunning lasers and spectacular firework finale this will be a magical evening of musical entertainment. Disabled facilities: The concert takes place on a grass lawn with access from the disabled car parkbeing a tarmac road. Carers will receive a 50% discount on the price of their ticket. There is nodisabled viewing platform. Special arrangements for car parking is made for blue badge holders,please have your badge on visible display within your vehicle and please follow the directionalsignage on the evening. Directions: 15 miles northeast of York, just off the A64, please follow the brown and white tourism signs/concert signage. Parking: Free car parking is available on site please follow the concert directional signage. Picnics: This concert is picnic style, so please bring your own food, drink, chairs and rugs. There will be a selection of hot and cold food and drinks available onsite as well as a fully licensed bar. You can also pre-order your picnic hampers by telephoning 01423 563563. Gazebos: No gazebos are permitted, expect those pre-booked in advance. A limited number of exclusive gazebo hospitality packages are available, please telephone 01423 563563 for further details.